Diacoustic, a term no longer in use, referred to the study of sound passing through various media. 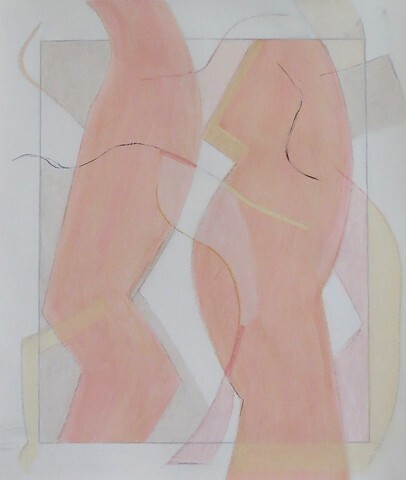 The large shapes in these works suggest the human figure so what passes between us? What remains contained? How permeable or porous do we allow ourselves to be? What do we absorb from the other? And how are we changed? In these works I explore the boundaries between realism and abstraction, the body and the spirit, restraint and abandon, reason and intuition. How delineated, permeable are these boundaries? Each work originates from an image that evokes a strong visceral reaction in me; images full of movement and intensity. Within the contained rectangle of the paper, I attempt to capture this power with a gesture drawing - my immediate, direct, and physical response. The gesture becomes the underlying structure of the work, which I then improvise upon through the addition of various media. My process moves between immediacy and caution as I explore the boundaries between the real and abstract and attempt to mine and capture the ineffable from the material world. I began making these collages in response to John Chamberlains large abstract sculptures constructed from automobile parts. His work is three-dimensional collage. Rather than automobile parts, I select from magazine pages to create two-dimensional abstract constructions. I find my collage pieces by tearing and folding, accumulating many abstract parts. I do not use scissors, which results in only torn or straight edges. From my collection of paper parts, I assemble and reassemble multiple times, discovering expressive connections among the pieces. As John Chamberlin said, its all about the fit. Often, as a result of a collages silhouette and sense of gravity, anthropomorphic or zoomorphic traits emerge. By grouping the collages in groups of two or three, a dialogue is created among them.